Take a look at these neurons. Ignore the fact that several of the brain cells look like snowflakes and at least one looks like an avocado. Can you pick out the drawings done by experienced, professional neuroscientists? What about the ones made by undergraduate science students? 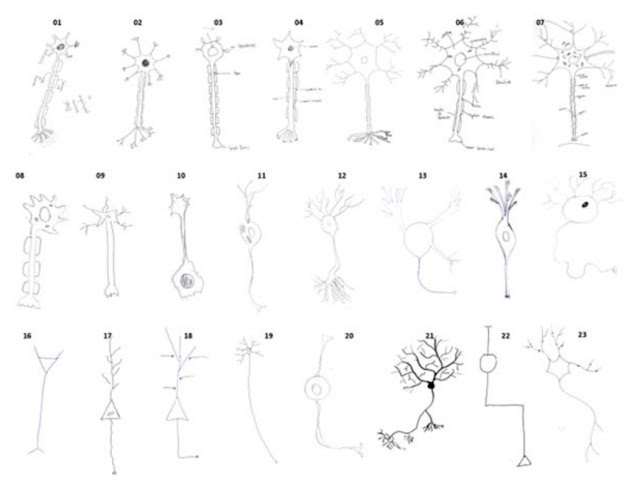 Researchers at King's College London gave a simple task to 232 people: "Draw a neuron." (Actually, being British, they said "Please draw a neuron.") Some of the subjects were undergraduates in a neurobiology lecture. A small group were experienced neuroscientists who led their own research labs at the college. And a third, in-between group included graduate students and postdocs. The researchers saw marked differences in how the three groups drew their brain cells. To confirm what they saw, they also pooled the drawings together and asked a new batch of subjects to sort the drawings into categories. These subjects agreed: the drawings clustered into distinct styles. The results are in the journal Science Education. Did you pick out the pictures in the top row as examples from undergrads? Student sketches had lots of detail and were often labeled. 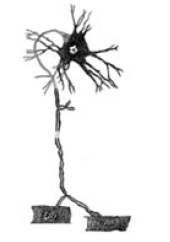 In fact, they mostly resembled this classic textbook drawing from 1899, which the authors describe as the "archetype" of brain cells. The graduate students and postdocs, whose drawings are in the middle row, seemed to fall somewhere in between. They didn't label their drawings like undergrads did, and they didn't include quite so much detail. Their neurons were more likely to bend, and the nuclei of the cells were often hidden—in other words, the cells looked more like they would under a microscope, rather than on a textbook page. But they weren't quite as simplified and abstracted as the lab leaders'. Lead author David Hay says that the three drawing styles represent "different cultures." Undergraduate students spit out textbook images; scientists in training draw on their own observations; and more experienced scientists make "highly conceptual" drawings that represent their personal judgment. This matters because "learning to reproduce the textbook images is NOT learning science," Hay says. 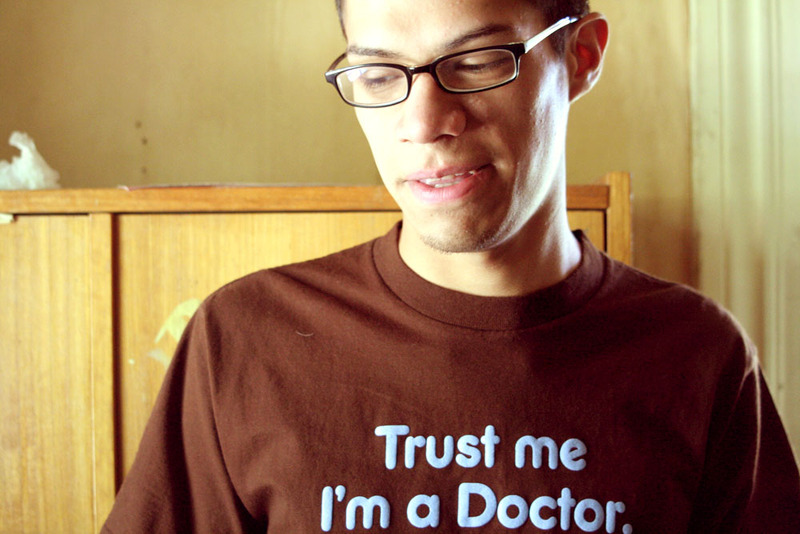 Even postdoctoral researchers didn't seem to have internalized the concept as much as the lab leaders had. However, Hay thinks there are ways that experienced scientists can help students gain perspective. One way might be by physically acting out scientific ideas. After Hay and his coauthors had students try a couple such exercises—for example, walking on different paths through a laboratory to mimic how neurons grow—the students produced drawings that were more creative and less like the textbook. Hay thinks students need to internalize scientific concepts before they can play around with them and make their own hypotheses. "Scientists do not simply know information," he says; "they put information to work to discover something new." Failing that, they can create formidable Pictionary teams. At a McDonald's shareholder meeting last week, a nine-year-old girl accused CEO Don Thompson of sneaky advertising. Stop "tricking kids into eating your food," she demanded, saying that McDonald's ads tell kids to "keep bugging their parents" until they get that Happy Meal. In the world of fast-food chains, though, the golden arches may not be the sneakiest purveyor of excess calories. 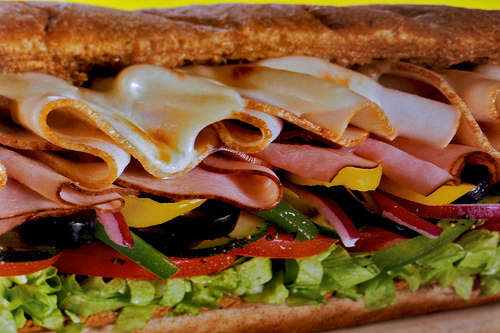 Diners in all kinds of fast-food restaurants underestimate the calories they're taking in—and the most dramatic underestimation happens at Subway. Thompson may not have been swayed, but Jason Block of Harvard Medical School and a group of other researchers writing in BMJ do care what consumers think about their fast food. Specifically, they care how many calories people think they're eating. To find out, they went into the trenches: 80 fast-food restaurants in New England cities. Researchers stood outside their chosen dining establishments (which included McDonald's, Burger King, Subway, Wendy's, KFC, and Dunkin' Donuts) in 2010 and 2011. They asked customers on their way in whether they'd be willing to save their receipts and answer a few questions when they came back out. (Only a few restaurants kicked the researchers off the premises.) At dinnertime, they targeted adults, either eating on their own or with kids. At lunchtime and after school let out, they went to fast-food places within a mile of a school and talked to adolescents. In all, more than 3,000 people participated. Across all the restaurant chains, the average dinnertime meal for adults was 836 calories, and the average afternoon meal for adolescents was 756 calories. Yet when asked how many calories they thought their meals held, people consistently guessed too low. And the bigger their meals were, the more severely they underestimated. The researchers also asked subjects whether they'd noticed any calorie information indoors. "All of [the chains] provide information in some way," says Block—"on a wall poster, on napkins/cups, on sandwich wrappers and tray liners, and on 'special menus' that might present items that are below a certain number of calories." Yet less than a quarter of adults said they'd even noticed this information. Those people didn't do any better at estimating their calories than others. Did they use the information to help them make menu choices? Only five percent of all adults said yes. Of adolescents, two percent. Block says it's easy for diners to miss the calorie information provided by fast-food chains today. But soon, as part of the Affordable Care Act, all chain restaurants with more than 20 locations will have to post calorie information in a standard format. "The menu labeling regulation will require the calories to be up front and highly recognizable," Block says. Even this kind of prominent labeling has had mixed results in past studies. However, Block adds, the new law will also require menus to post an "anchoring statement" pointing out that people only need about 2000 calories a day. This might make, say, the 970 calories in a Wendy's Baconator more meaningful to a customer. Anchoring was effective in at least one small study, Block says. Other studies have looked at "traffic light" labeling (in red, yellow, or green), or listing calories in terms of how much exercise you'd need to burn them back off. "We'll be in a position to know much more after the federal law is implemented," Block says. His group is collecting data this year and next year to see how well the new labeling works. If people do start noticing how many calories their favorite chains are offering, they may be surprised. When researchers broke down their results by restaurant chain, they found that people underestimated their calories more dramatically at some restaurants than others. At McDonald's, adults guessed too low by an average of 100 calories, and adolescents by a little more than 200. The guesses were off by a bit more, on average, at Burger King and Wendy's. At Subway, the errors were most extreme: adults underestimated their calories by an average of about 350, adolescents by close to 500. Five hundred calories is equivalent to all the bread in a 12-inch sub (or, if you opt for multigrain, all the bread plus four American-cheese triangles). It's a lot not to know you're eating. This mistake, the authors write, may happen because people view Subway with a "health halo." After seeing TV ads featuring fresh vegetables, smiling Olympians, and Jared's old pants, consumers may think they're making a healthier choice than they are. The new calorie labeling could help most in places like this. A fast-food chain that brands itself as healthy is even sneakier than someplace like McDonald's, which even little girls know is bad for you. It's hard to keep your footing in a steep tunnel made of loose dirt while others are scrambling around and over your body. Harder still in pitch blackness. That's why fire ants build tunnels that will catch them when they fall—a strategy human engineers might want to steal. "Slips and missteps are likely a constant, recurring feature of life underground," says Nick Gravish, a graduate student in Daniel Goldman's rheology and biomechanics lab at Georgia Tech. Yet ants have to traverse their tunnels quickly, especially when there's a colony emergency like a flood or destruction by a gardener's spade. To study how ants engineer their tunnels, Gravish brought the fire ant Solenopsis invicta into the lab. Invasive to countries around the world and packing a nasty sting, these South American ants deal out plenty of hardship. But Gravish was interested in how they handle adversity themselves. First, the ants were put into "laboratory soil" (actually tiny glass balls) to dig. 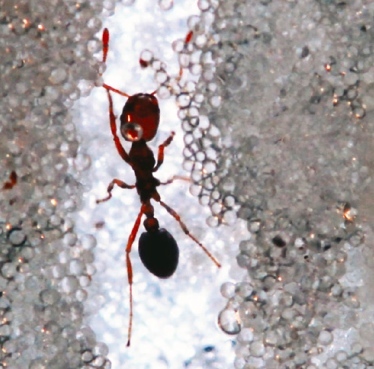 Researchers took x-ray CT scans of the resulting tunnels and found that no matter the moisture of the "soil" or the size of the glass beads, ants dug circular tunnels of approximately the same diameter. That diameter was just a little bit more than the length of their bodies, not counting legs or antennae. This suggested that the diameter of the tunnel was crucial to the fire ants. To see how well the ants moved within these tunnels, the researchers recorded video of them climbing as fast as they could. ("We startled them into climbing at high speed by exhaling gently into the nest," Gravish says.) They saw that ants were able to navigate their tunnels quickly, reaching speeds of more than 9 body lengths per second. They also saw that sometimes the ants slipped and had to recover their footing. Now the reason ants build tunnels so close in diameter to their own body length became clear. Ants responded to a fall by spreading all their appendages wide and waiting until they jammed to a stop. "One of the coolest things we found was that fire ants used their antennae to brace themselves," Gravish says. While falling, the ants turned these delicate sensors into extra load-bearing limbs. When the glass tube width increased to 1.3 times the ants' body length, the strategy began to fail. The tunnels ants built themselves had an average diameter of just 1.06 times their body length, the authors report in PNAS. It seems fire ants put most of the responsibility for stopping falls on the tunnels themselves. After that, all a plummeting insect has to do is stretch out its limbs. Gravish likens this strategy to the way humans build stairs. Steps are engineered to fit our bodies. If they're too tall or short, we struggle to use them (or maybe just fall down them). But with the right design, our environment works with us to get us where we're going. This strategy could inspire how we design robots for confined spaces such as search-and-rescue zones, Gravish says. For instance, "falling is usually considered a failure mode for a robot." But fire ants seem to use little falls to descend more quickly through their tunnels. If engineers knew the size of the cracks and crevices in a disaster area, they might be able to send in many inexpensive robots designed to tumble through those spaces—rather than one very expensive robot built to keep its footing. What about humans ourselves: would we benefit from building tunnels that were only as wide as our head-plus-torso length, like the ants? Gravish points out that fire ants often fall many body lengths before catching themselves, making this not such a great strategy for people. "Ants have a robust exoskeleton," he says. "We humans are quite soft in comparison." 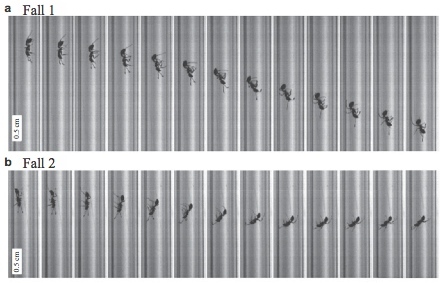 Images: ant in tunnel by Laura Danielle Wagner; ants falling by Gravish et al. "Simple" is often a compliment in the human world, used to describe low-fuss dinners or closet solutions. When scientists use "simple" to describe an animal, they mean something more like, "That sac of goo has no business acting clever." An especially simple creature—a sea slug—recently demonstrated that despite its humble resources, it can learn from experience and form new hunting strategies. Smaller goo sacs, beware. Despite its squishy stature, the sea slug Pleurobranchaea californica is a killer. It roams the sea and swallows whatever appealing morsels are in its way. Being blind, it can't tell how tasty its prey looks—or doesn't. It can't see, for example, the flashy coloration of the "Spanish shawl" nudibranch (Flabellina iodinea). If it could, it might guess that those bright pink and orange hues are a warning: Flabellina is not nice to eat. It steals stinging cells from its own prey (such as corals and anemones) and stores those stingers in its bristles. Rhanor Gillette, a neuroscientist at the University of Illinois, Urbana-Champaign, observed that not only do Pleurobranchaea slugs spit out Spanish shawls, but they seem to remember and avoid the animals in the future. To study how well the predatory sea slugs learn their lesson after tasting Flabellina, he and graduate student Vanessa Noboa set up a meet-and-greet between the two species. On the first day, this interaction happened five times. By the end, most of the Pleurobranchaea slugs were much slower to take a taste of the Spanish shawls, or were ignoring them altogether. Twenty-four hours later, the sea slugs were still reluctant to approach Flabellina. Even after 72 hours, they remembered what they'd learned. Gillette and Noboa report their results in the Journal of Experimental Biology. Since the predatory slugs seem to sniff something in the water that makes them turn away, the researchers think the noxious Spanish shawls give off a distinctive warning odor. Learning from an unpleasant taste experience, then using that memory to change one's hunting strategy, is "a real cognitive trait," Gillette says—in other words, a "goal-directed use of knowledge." 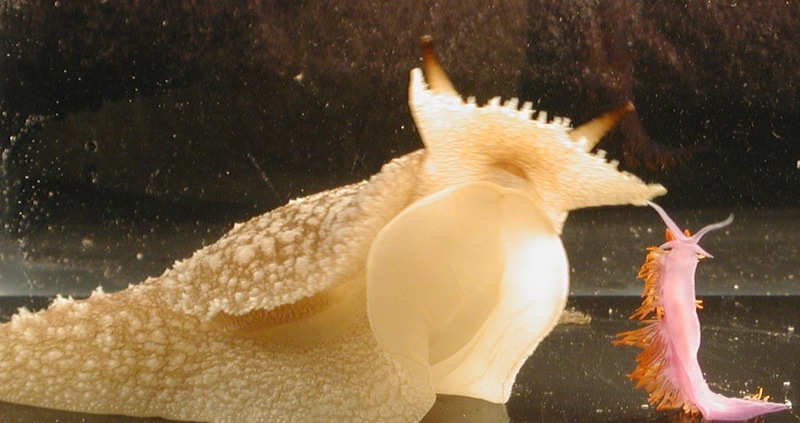 The Pleurobranchaea slugs learned to avoid the smell of Flabellina, although they continued to eat a related, non-stinging species without hesitation. Being able to change their feeding strategy is a good thing, since these slugs are generalists. Everything in the path of their oozing is a potential meal. "More specialized animals, say sea-slugs that may munch on a particular kind of sponge, may not need to employ such learning abilities," Gillette says. For a hunter like Pleurobranchaea, the decisions aren't so simple. All it takes is an antenna on a headband. 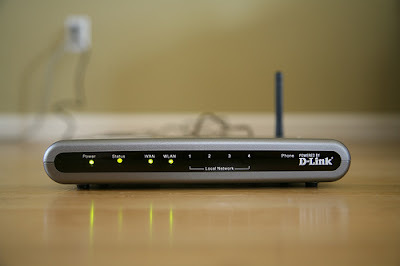 If you've got a breathless video report on the dangers of wireless internet connections, that will help your case. It doesn't take much, though, to turn an ominous hint into a real headache. There's no known scientific reason why a wireless signal might cause physical harm. And studies have found that even people who claim to be sensitive to electromagnetic fields can't actually sense them. Their symptoms are more likely due to nocebo, the evil twin of the placebo effect. The power of our expectation can cause real physical illness. In clinical drug trials, for example, subjects who take sugar pills report side effects ranging from an upset stomach to sexual dysfunction. Psychologists Michael Witthöft and G. James Rubin of King's College London explored whether frightening TV reports can encourage a nocebo effect. They recruited a group of subjects and showed half of them a clip from a BBC documentary about the potential dangers of wireless internet. (The BBC later acknowledged that the 2007 program was "misleading.") The remaining subjects watched a video about the security of data transmissions over mobile phones. 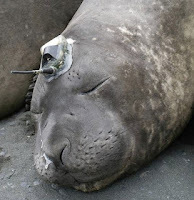 After watching the videos, subjects put on headband-mounted antennas. They were told that the researchers were testing a "new kind of WiFi," and that once the signal started they should carefully monitor any symptoms in their bodies. Then the researchers left the room. For 15 minutes, the subjects watched a WiFi symbol flash on a laptop screen. In reality, there was no WiFi switched on during the experiment, and the headband antenna was a sham. Yet 82 of the 147 subjects—more than half—reported symptoms. Two even asked for the experiment to be stopped early because the effects were too severe to stand. Witthöft says he expected to see a greater effect in people who had watched the frightening documentary. This wasn't the case overall. Instead, the movie mainly increased symptoms in subjects who described themselves beforehand as more anxious. "It suggests that sensational media reports especially in combination with personality factors (in this case anxiety) increase the likelihood for symptom reports," Witthöft says. Plenty of symptoms were reported without the sensationalist TV show, though. The antenna on the head, the researchers' allusion to a "new kind of WiFi," and the instructions to monitor their bodies closely were enough to trigger symptoms in many people who watched the other video. Witthöft points out that his study would have been stronger if there were a third group of subjects who didn't wear the "WiFi" headband at all, but were simply told to pay attention to their bodies for 15 minutes. This kind of attentiveness might trigger symptoms on its own. Still, Witthöft says, "I think the high percentage of symptom reports nicely shows how powerful nocebo effects are." Though the researchers set out to show how irresponsible reports in the media can trigger a nocebo effect, they ended up showing how easy it is to make a person feel sick with just a a prop and a few choice words. Even a National Radio Quiet Zone can't protect against that. 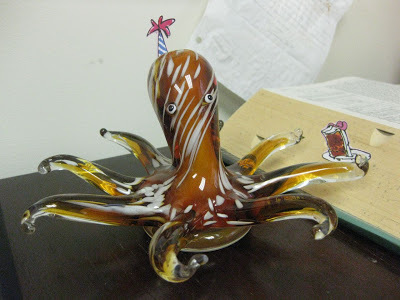 Inkfish is three years old today! One great thing about blogs that doesn't apply to real three-year-olds is that you can change their name and appearance at will. I'm getting tired of "Inkfish"—too mysterious, too many creepy arms. Too much guilt about mistakenly calling octopus arms "tentacles" on occasion. So I'd like to give the blog a new name and a new look. Below are several directions I'm considering. I hope that you, readers, will weigh in. Banner art: a weeping woman with her feet in a small tub of brown water. Foregrounded, a glass of kale juice with a party umbrella. Inspiration: juice cleanses, foot detox, everything else. Banner art: a blogger on a couch in a dark room, gently lit by the glow of the laptop screen. Alternate art: not penguins. Irony could increase my readership among hipsters. Inspiration: penguins, penguins, penguins, penguins, penguins. Banner art: portrait of Carl Zimmer. Inspiration: trying to lure Bing users who are searching for Carl Zimmer's blog, The Loom. Banner art would be a rotating selection of photos: crabs wearing GPS devices, pigeons carrying cameras, penguins with earmuffs, and this seal. Banner art: a mouse that's quiet—too quiet. Inspiration: unusual internet searches addressed at the help desk. Banner art: the empty vanilla ice cream bowl I considered using to illustrate a story about sperm-eating flies. Please leave your votes in the comments (or just say hello). Thanks for your help, and thanks as always for reading! What's the Point of Making This Face When We're Scared? If cartoonists ever pause in their sketching to ponder human evolution, they must feel grateful to the forces that shaped our fear expression. All it takes is a pair of extra-wide eyes to show that a character is freaking out. There may be a point to this expression beyond making artists' lives easier: widening our eyes expands our peripheral vision, and might even help other people spot the cause of our alarm. "Our lab is interested in the evolutionary origins of emotional expressions," says Daniel Lee, a graduate student in psychology at the University of Toronto—in other words, "why they look the way they do." When we feel afraid, for example, is there a point to stretching out our eyelids and raising our eyebrows to the ceiling? Subjects were tested with flashing images on the screen in their peripheral vision. Lee found that people making a disgusted expression—with the eyelids narrowed as in "Ew, get that out of my face"—scored the worst. 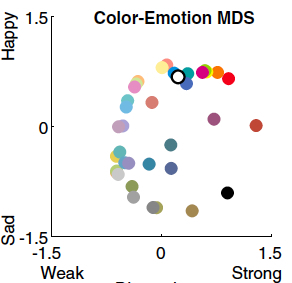 People making a wide-eyed fear expression scored the best, with a useful field of vision 9% larger than that of people with a neutral expression. Being afraid, then, may help us gather more visual information about whatever's threatening us in our environment. But does it also help us communicate that threat to our companions? 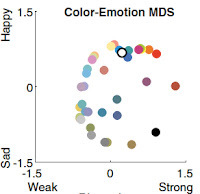 The researchers next used pictures of models' eyes expressing different emotions to create simplified, graphic eye images. (They didn't use real eyes because those might have conveyed extra emotional information, instead of only varying in wideness.) Subjects saw these eye images flash briefly on a screen, looking toward the right or left by varying degrees. Lee found that when the eyes were wider, subjects had an easier time telling which way they were looking. The results are reported in Psychological Science. "We believe the widening eyes of fear...[are] a functional response for vigilance toward threat," Lee says. When we're scared, he thinks, widening our eyes helps us to see threats and to communicate their location to our group. 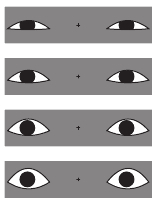 The researchers point out that human eyes are uniquely suited for this kind of communication: we're the only primate with a white sclera (the area outside the iris). In other apes and monkeys, this part of the eye is dark. It's yet another factor that cartoonists, no doubt, appreciate. While male birds are singing elaborate arias and flashing their feathers, it's easy to imagine their female counterparts are unimportant actors. Duller and quieter, all a lady bird has to do is hold still and let one of these frantic performers mate with her. Yet in brown-headed cowbirds, at least, the quiet female keeps the whole society in order. Scientists discovered this by targeting a tiny portion of the female brain and frying it. Males of the species Molothrus ater use their songs to compete with each other and to woo females. Once a a mating pair forms, they stay faithful to each other for the whole mating season, the male guarding his partner from rivals. Near the top of the bird brain, a region called nucleus HVC controls females' choosiness toward their potential mates. Scientists at the University of Pennsylvania and Wilfrid Laurier University performed brain surgery on female cowbirds, carefully destroying only this region. Then they put their lobotomized females back into the dating arena to see what would happen. Normal females were choosy, only responding to the highest-quality male songs. Females who'd had brain surgery, though, responded positively to every song. 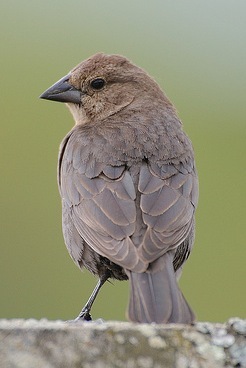 The researchers wanted to see what effect the females' new, lax attitude would have in cowbird society. So they put post-surgery females, normal females, and males in one big group together. Then they watched. At first, it looked like nothing was different. Females missing their HVC seemed to act the same as females with intact brains; once they were all together in the aviary, there was no clear difference in how often females approached male birds or in how they "chattered" back at males to encourage their singing. Nevertheless, something had changed. The other birds in the aviary treated post-surgery females differently. For one thing, females missing their HVC were serenaded by a greater variety of males, even once they'd chosen a mate. Normally, a female who's bonded with a male hears his song almost exclusively. This is a measure of how strong the bond between partners is, says study author David White. Now, with more males bending a female's ear, her pair bond was weaker. There were other changes too. With the altered females introduced into the group, female birds competed more for mates. And the whole hierarchy of male birds, which is established before the breeding season starts, was disrupted. Male cowbirds sing at each other to show who's dominant. 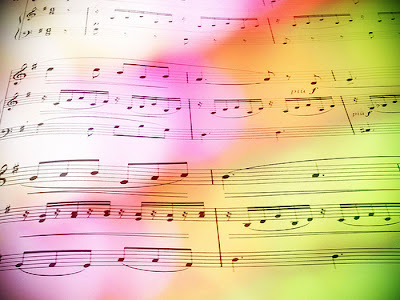 After the HVC-less females came to live with them, the rules about which males were dominant singers shifted significantly. "The result in this paper turned everything around for us," White says. Previously, it had seemed to be the male cowbird's responsibility to create a strong bond with his partner. Females appeared to be passive agents in the group. "They don't sing, they don't fight," White says. "They don't, to our eye, do much of anything." Yet when the choosiness was erased from females' brains, the whole group dynamic changed. "Now we could see that it was the female that was playing a much more active role in pair-bonding, and in all sorts of other roles within the social network," White says. Everything depended on her song preferences. Incidentally, it's not clear why female cowbirds bond with males at all. Females have likely evolved to pick mates whose songs demonstrate—somehow—that they have the best genes. Then the males keep singing to the females throughout the breeding season, strengthening the bond between them. Usually, White says, bird couples only form strong bonds when both parents will need to care for the young. But cowbirds "are very bad parents overall" who abandon their eggs in the nests of other birds. The powerful bond between cowbird partners "really makes no sense," White says. Yet once they're bonded, males direct almost all their singing to their partner and never try to mate with other birds. "They follow each other around, they eat together, he comes when she calls him," White says. If a female dies or disappears, he adds, "her pairmate just becomes a wreck. We call it the widowed male phenomenon." After the loss of his mate, the male gives up for the season. "He flies around looking for her," White says. To him, at least, the quiet female never seemed unimportant.